2.INSTALLATION EASILY -Â Simply stake the projection light into the ground and you have a secure, tool-free installation. Alternatively, you can mount it to a structure using a sturdy hanging clamp and safety cable. 3.WATERPROOF & WEATHER-RESISTANT – Waterproof and Weather-resistant cap to help protect the connection from the weather of sunlight, rainy, and snow. Working Temperature: -20-40 ?, waterproof IP44. 4.RF Remote Control: With our wireless RF controller from up to 50ft away,you can change different modes, Energy efficient to save you money, automatic timer, you can also choose to use the remote control to change 2H, 4H, 6H auto turns off. 5.SUITABLE FOR VARIOUS THEME – 16pcs switchable pattern lens for all seasons decoration theme,including Thanksgiving,Christmas,Halloween,Easter,Valentine’s day,Patrick’s Day,Birthday,wedding,party,bar,etc. 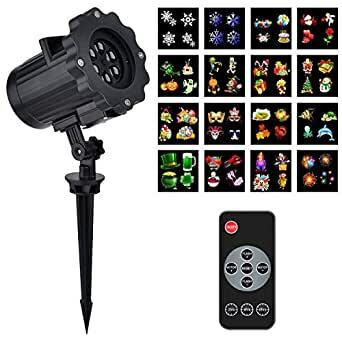 This LED landscape projector light can be widely applied in Christmas, Thanksgiving Day, Halloween, Birthday Party, KTV, clubs, pub, banquet, weddings, family parties, kids room, lawn, path, courtyard, home garden; Creates an instant atmosphere for parties and entertaining.